SINGAPORE, June 8, 2016 – Royal Caribbean International today announced that it will homeport its billion-dollar smartship Ovation of the Seasin Singapore in 2017 for one season, bringing thousands of travellers to the region and injecting millions into the local and regional economies. The announcement was made during Ovation of the Seas’ maiden call in Singapore, where a plaque and key ceremony was held in the presence of over 200 government and industry partners, with Mr Lionel Yeo, Chief Executive of Singapore Tourism Board (STB), Mr Alexander Hungate, President and Chief Executive Officer of SATS, and Ovation of the Seas’ Captain Flemming Nielsen. The ship has ended her 14-night cruise from Dubai to Singapore. Making history as the first international cruise line to deploy a brand new ship to Asia for homeporting, Ovation of the Seas was delivered in April. At 347m long, 168,666 gross registered tonnes, carrying 4,905 guests in total and laden with first-at sea features and technologies, the smartship will be the largest and most technologically-advanced ship to call Singapore home next year. Over her 10 sailings from March to April 2017, Ovation of the Seas is expected to add some 42,000 additional guests to the Singapore cruising scene, and delivering millions through in-port spend. She will offer return trips ranging from 3 to 5 nights to Penang, Phuket, Bangkok (Laem Chabang), and a one-way cruise to Tianjin with calls at Ho Chi Minh City (Phu My) for an overnight, Hue/Danang (Chan May), Hong Kong and Seoul (Incheon). 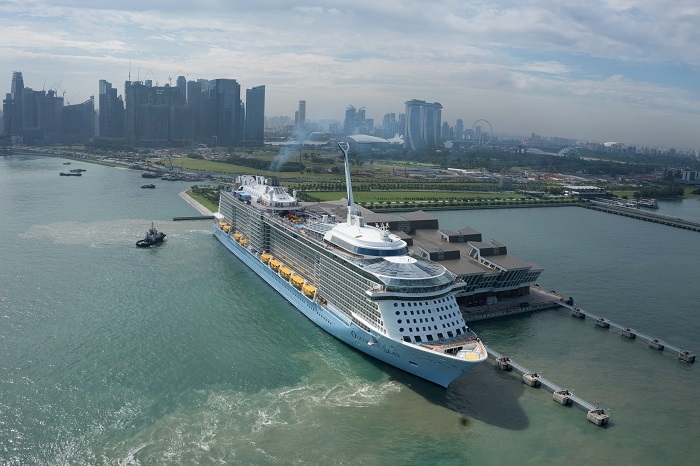 Royal Caribbean’s Senior Vice President, International, Mr Gavin Smith said, “We’re thrilled to bring one of the world’s most innovative cruise ships to Singapore and the region, and take cruise travel here to new heights. “Joining Mariner of the Seas and Voyager of the Seas, the addition of Ovation of the Seas means we will have the largest cruise fleet deployment of any brand in Southeast Asia. Mr Smith further shared with the deployment of Ovation of the Seas, plus the return of Voyager of the Seas in May and Mariner of the Seas in October, this will increase Royal Caribbean’s capacity in 2017 in Southeast Asia by 30 per cent over 2016. Mr Yap Chin Siang, Assistant Chief Executive (Policy and Planning), Singapore Tourism Board, said: “The homeporting of the Ovation of the Seas is a testament to the appeal of cruising from Singapore. It is also very timely – the upcoming Visit ASEAN@50 celebrations in 2017 will highlight the best of Southeast Asia, and cruises offer the perfect way to experience the warm hospitality of the region. Guests on board the 18-deck smartship will enjoy the ‘North Star’, an observation capsule that rises 92 metres over the ocean; ‘Two70’ – a S$18.5 million hi-tech entertainment venue; cocktails served by robots at the ‘Bionic Bar’; skydiving and surfing experiences; interior virtual balconies with real-time ocean views; luxurious Loft suites with large living areas and private concierge service; and ‘SeaPlex’, the largest indoor activity space at sea – housing a basketball court, circus school, roller-skating, bumper cars, and more. Ovation of the Seas also boasts 18 restaurants with cuisines from around the globe, including imaginative cuisine at Wonderland, and Jamie’s Italian by celebrity chef Jamie Oliver; the fastest internet connection speeds at sea; and a collection of artwork valued at more than S$6 million.